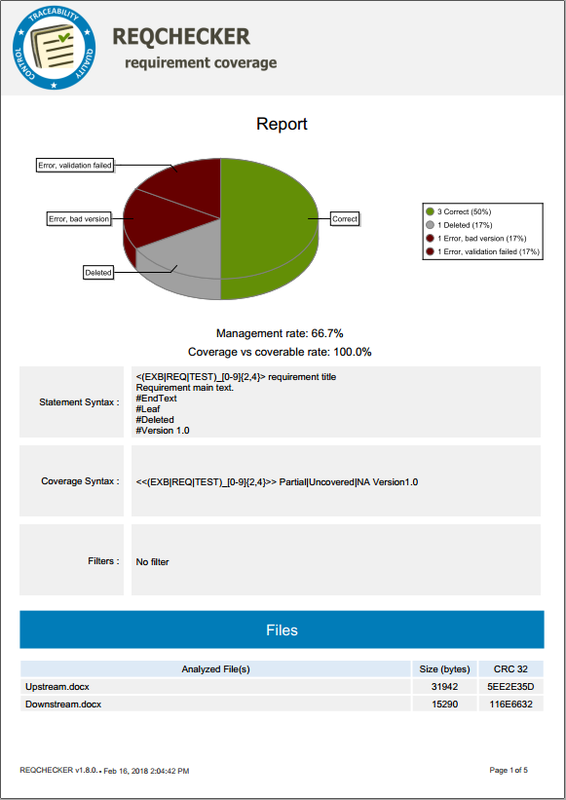 Coverage PDF Report contains all coverage information under almost non-modifiable PDF format. It is intended for end customers. It proves the coverage rate. The format is PDF with bookmarks and internal links. The pie chart presents the share of each status. Pie char colors can be customized. The first page presents the statement and coverage syntax and the active filters. The section FILES lists of analyzed files present each input file, its size and CRC code at read time. The section SUMMARY list all requirements with status, ID, Version and Title. The ID is an hyper-link to the requirement details below in the report. The sections CORRECT, PARTIAL etc. present the details of each requirement grouped by status. Coverage presents the location where the requirement is covered. A required can be covered at several location.